Mission complete! I finished it just in time to present to Tony at his Birthday Party, complete with camouflage wrapping paper and tissue. You can see how the stain took to the burned areas, adding warmth and another degree of life. He loves his gift and all-in-all I’m pretty pleased with it as well (especially having never done wood burning before). The only thing left to do now is find the perfect spot to hang it! Here’s a picture of my baby with his present (yes, I made the banner as well). Thank you all for your love and support throughout this pilot production of my first blog-cast project! I enjoyed documenting my experience and perhaps it will help inspire someone else to take on a new and challenging craft. 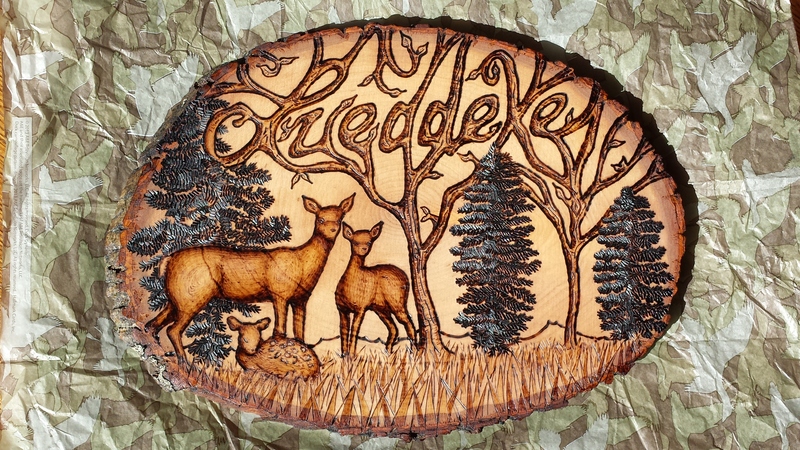 If wood burning is one you decide to give a shot, I’d be happy to help or answer any questions. Or if there is something different that you would like to see me try, throw it out there! I just might give it a shot.